On November 26, the country observes yet another Constitution Day, the day on which in 1949, the Constituent Assembly adopted and gave to the people of India a landmark Constitution. The Constitution of India besides being sacrosanct to every citizen of the country is the bulwark of fundamental rights and directive principles, which are a prerequisite for any healthy democracy. The Preamble, with its emphasis on justice, liberty, equality and fraternity; and its commitment to India being and remaining a “sovereign socialist secular democratic republic spells out the vision and the intrinsic character of the Constitution. The Constitution of India with its minute details is undoubtedly a unique one. Thanks to the women and men of the Constituent Assembly, most of the people of India, take genuine pride in our forward-looking and all-embracing Constitution. Sadly, in the recent past, several efforts are being made to tamper with the Constitution, to negate its essence and even to delete core dimensions like the words secular and socialism which are deeply interwoven into the pluralistic fabric of Indian society. The current BJP/RSS combine, including some of their ministers and leading functionaries have gone on record saying that once they have the pre-requisite numbers in Parliament, they will have no qualms of conscience to change fundamentals of the Constitution like that of secularism and equal rights for all. There have been lofty proclamations for the establishment of a Hindu State by 2020; the annihilation of the minorities particularly the Muslims and Christians. There is talk of a Common Civil Code and that the rights of the minorities have to be abolished. The waters are constantly being tested. As part of a well-planned strategy, they blow hot and blow cold with their patently anti-national words and deeds, thus defocusing from the serious and pressing problems that grip the ordinary citizen of the country. On November 23, the "Ahmedabad Mirror" in a front-page exclusive exposed how the BJP Government of Gujarat, was demanding that through an online form minority students appearing for the Stds X and XII had first to identify themselves if they were Muslim or not. The hackles of several have been raised in the State, but it is left to be seen if the Government will actually withdraw this anti-Constitutional form. "In the opinion of this Court gone are the days of laissez-faire when there used to be criminal tribes or the days of regimentation when there used to be law relating to criminal tribes. Once this country has adopted the Constitution, we have to abide by the same, which is the fountain source of law. No part of the Constitution permits any sort of classification of criminals on any communal basis. "A criminal is a criminal, whether he is a Muslim, a Hindu, a Sikh, or a Christian. A criminal has no caste or community and, therefore, if any survey or census is to be made or any information is sought to be gathered with regard to the survey or census or the move to seek information may be, as a part of routine exercise, cannot be based on a communal footing. "Here the messages clearly show that they have been issued with reference to the communities such as Christians or Muslims. In any case, such exercise cannot proceed with orientation based on a creed or community. May it be a routine exercise for any purpose including the purpose of collecting information on the items mentioned in the fax messages in question, there cannot be a religion or community wise classification to identify the criminals, from amongst the members of the Indian society." The survey was immediately withdrawn. Last October, in the wake of the Supreme Court ruling to allow young women entry into the Sabrimala Temple, the BJP national president Amit Shah not merely questioned the judgement but in fact defended the practice of keeping women out. The UP Chief Minister Yogi Adityanath has gone on a city name-changing spree with clear prejudicial overtones against the Muslims of the country. The recent comments by the Prime Minister, the CM of UP and those some others on Ayodhya, and on the Supreme Court's position on the Babri Masjid, should warrant a 'suo moto’. The judiciary has the fundamental responsibility to safeguard the Constitution. There have certainly been some landmark judgements. 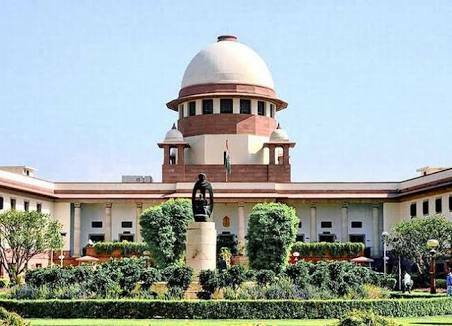 However, last January, four senior most judges of the Supreme Court (including Justice Ranjan Gogoi, currently the Chief Justice of India) held an unprecedented Press Conference asserting that unless things are set in order and that the Government stops interfering in the judiciary, democracy will not survive in the country! The way the Government procrastinated on the appointment of Justice KM Joseph to the Supreme Court (because he did not give a favourable judgement to the BJP as the Chief Justice of the Uttarakhand High Court), is a textbook example. The Government has not only tried to interfere in the judiciary, but has spared no effort to destroy the independence and the autonomous functioning of other Constitutional and statutory bodies. The Election Commission of India is today very different from what it once was. Hate speeches by the BJP candidates and fraudulent voting practices are just ignored. The Central Bureau of Investigation (CBI) has become a caged parrot apparently because of the inclination of the CBI Director to open investigations into the dubious Rafale fighter jet deal and the alleged corruption by the Ambanis. The Reserve Banking of India (RBI) is browbeaten to bend backwards to cater to the whims and fancies of a Government that has sent the country into an economic spiral downwards! Media, the fourth pillar of a vibrant democracy, has been made impotent. Only a handful of those in the electronic and print media will dare take on the Government today. Other important bodies, like the Information Commission, have been made toothless and filled only with their pliable henchmen! The visionary Dr BR Ambedkar, the father of our Constituent Assembly was perhaps prophetic when he said, “Will history repeat itself?" It is this thought, which fills me with anxiety. This anxiety is deepened by the realisation of the fact that in addition to our old enemies in the form of castes and creeds, we are going to have many political parties with diverse and opposing political creeds. Will Indians place the country above their creed or above their country? I do not know, but this much is certain that if the parties place creed above country, our independence will be put in jeopardy a second time and probably be lost forever. This eventuality we all must resolutely guard against. We must be determined to defend our independence with the last drop of our blood! We must heed his words! Every citizen of India has a moral obligation to defend all that is sacred in the Constitution. We cannot sit in our comfort zones and allow the values enshrined in our Constitution to be destroyed by these anti-Constitutional elements! “We, the People of India", must rise as one people and realise that it is our Constitution. On Constitution Day, we all need to pledge that a sure way, by which we can protect our Constitution, is by showing these elements the door in the National Elections 2019!